These stems are hard to pronounce, not typically seen in grocery stores and are quite expensive, some can run as much as $7 a stem. 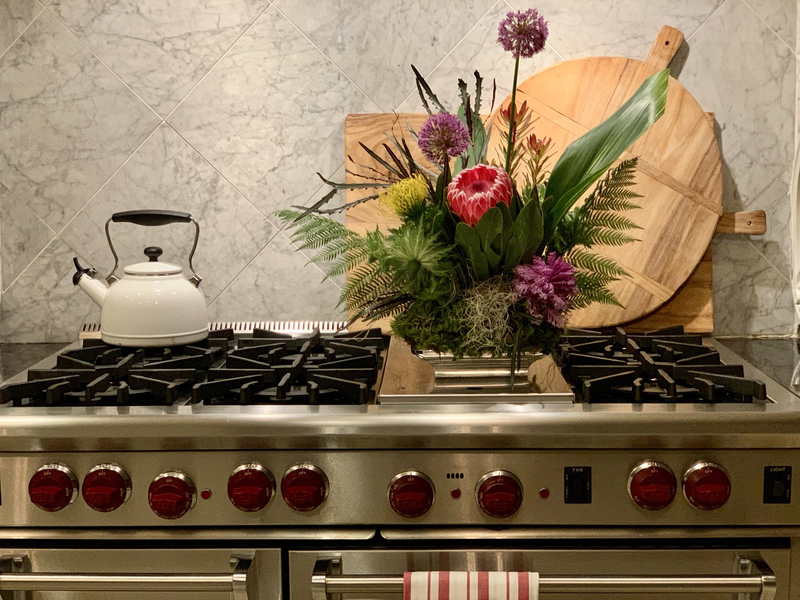 I used a wide variety to give you an idea of different types of florals and how to use them in an arrangement. Sounds like a bunch of Super Heros are coming to save the day! I admit, this isn’t a typical floral centerpiece, it’s an unusual combination of exotic stems..it sort of looks like the jungle floor of Jurassic Park with the ferns, moss and leaves. I like trying different and unusual things. As with many other arrangements I have made, I used instant floral foam, a flat container and tape to secure the foam after soaking it in water. I used 2/3 of a piece of foam. Always starting with the biggest stem, I cut the Protea Empress and inserted it into the foam at an angle. The stem is thick and woodsy and will require good shears to cut through it. Next, I used the Allium Gladiator flowers, which have very tall stems. I put them close together in the center of the foam. Next, I used the Pinchusion High Gold (yellow stem) and placed at an angle towards one side of the foam. This is a very cool flower with a large vibrant yellow head. Kale stems, I had 2, one went in front and one in the back of the foam. This unusual stem, is called Eryngium Green Jackpot. It grows well in dry, sandy soil with a lot of sun. I used 2 of them in the centerpiece, one of each side at different heights. Leucodendron Spray Jester “Safari Sunset” has rich variegated leaves and looks awesome in centerpieces. I did not cut the pieces, but left the 3 branches attached to the single stem. I added 2 Variegated Aspidistra leaves to balance the centerpiece. Separating some of the lower branches of the Arailia and using them as filler creates a nice balance. I used the large center piece and placed it in the middle of the foam. Helecho Holex is a fern commonly used in wedding centerpieces. I used 2 pieces on the sides for added balance. All the stems are in the centerpiece, now I have to cover the sides of the foam with moss. I used Mood Moss, which is lush and velvety looking. It is a clump moss that looks like it was picked from a mountain. I separated the large clumps and placed them on the sides of the foam, and used floral pins to secure the moss in place. There were a couple areas in the middle that I covered using Spaghnum Moss. This is a decorative dry moss that looks nice hanging down the side of a centerpiece and is commonly used to cover empty space. This is a very natural and woodsy feeling centerpiece. I like it, and I enjoyed learning about new flower varieties. Starting in April, we will return to home improvement projects as we begin work on our back patio and the One Room Challenge Returns on April 4! Stay Tuned! You can also get daily home decor inspiration by following along on Instagram HERE. If you use any of my tips to make a flower arrangement, tag me on Instagram, I would love to see it! You always say the right things 😉 Love you Lynn…hugs! You must have worked in a floral shop at one time to know about all those exotic specimens! Looking forward to the home reno projects. I am going to the local home show this weekend for some kitchen inspiration, as I really must get on it! That sounds like a fun job! Have always thought about doing something like that 🙂 I was taking a floral design class and learning about different kinds of flowers, it was really fun. But time to get back to home reno, have so much to do! Thanks for visiting Joni! Looks like I won’t be going to the home show today, change of plans, plus it snowed overnight and is cold out…..oh well, I guess procrastinating a bit longer won’t matter….. Snow! Wow..I hope you see some Spring weather soon Joni. Beautiful! You have an excellent eye for putting together these arrangements! Hi Kristin! Thank you, I think flower design is a lot like home design, all about angles, shapes, sizes and color. It’s important to stand back and check your work often, a minor adjustment can make all the difference in the appearance. Exotic plants are really fun to work with, so many different combinations and colors available. Hope you’re having a great Spring! The arrangement is still thriving and looking good. I had to remove a couple small stems but for the most part, it still looks great…almost 2 weeks now.